Leslie Mullane was born at Branxholme in 1895, a son of William Mullane and Ann Larkins. The Mullane family lived at Wallacedale but by the time Leslie was reaching his teens, the Mullanes moved into Hamilton, first living in Carmichael Street and later Cox Street and William Mullane worked on the railways. When Leslie was around eighteen, he started work for Doctor David Laidlaw as a groom. 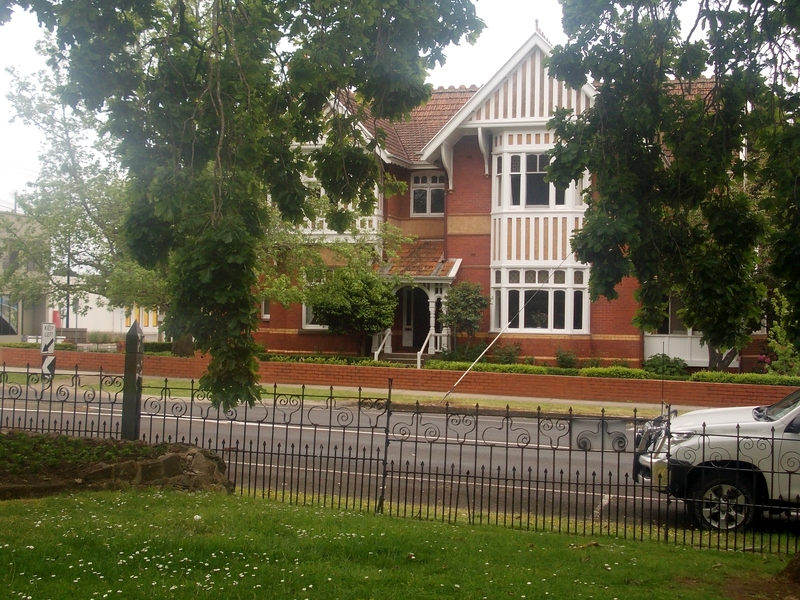 Dr. Laidlaw lived at Eildon (below) on the corner of French and Thompson Streets Hamilton. On 26 September 1916, Leslie enlisted at Hamilton and left for overseas with the 39th Battalion on 20 October 1916. Just two days out to sea, Leslie dropped a bottle over the side of the HMAT A17 Port Lincoln with a message inside addressed to his mother. On 21 November 1916, Mrs L. Crowe of Beachport, South Australia wrote to Mrs Ann Mullane telling her that a few days earlier she had found Leslie’s bottle. The message inside, written from “Somewhere at Sea”, stated all on board were well. Arriving in Plymouth, England on 9 January 1917, Leslie spent three months training in England before leaving for France on 25 April 1917. Once in France, Leslie spent a month with the 3rd Australian Divisional Base Depot before re-joining the 39th Battalion. By then the 39th Battalion were soon to face the Battalion’s first major battle at Messines, Belgium on the 7-9 June 1917. At five feet, 2 inches, Leslie was the smallest man in the battalion, slight and very young-looking. But despite his size, one of his fellow battalion members Walter Scott said he showed pluck and could keep up with the best of them. But it was maybe due to his size that one of his roles while serving was an officer’s batman. In October 1917, the 39th Battalion were a part of the battle at Broodseinde on 4 October. That was a success, but they were soon at Passchendaele and on 12 October things went bad for the allies with heavy losses. On that day that Leslie was wounded and taken to a dressing station. While waiting for attention, a shell burst close by and Leslie was killed. He was buried on Hill 70. Because of the action and disorder of the day, Leslie was counted among the missing. By December 1917, news had reached home and Leslie Mullane listed as missing in the newspapers. 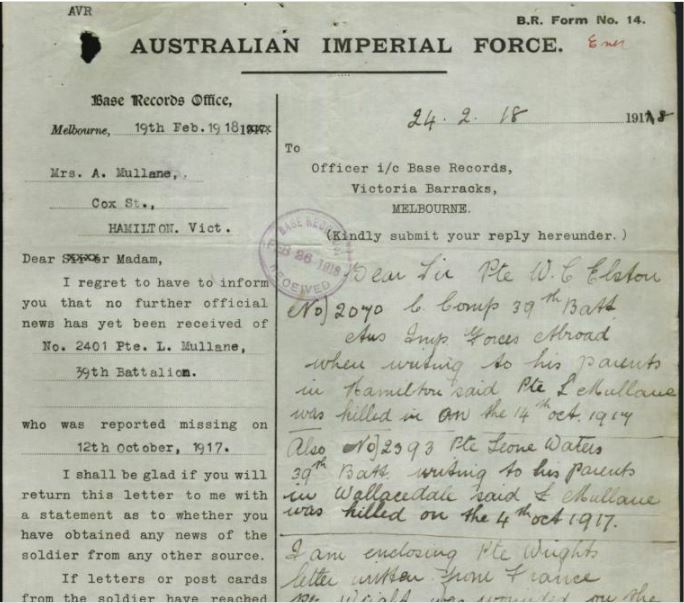 Base Records Office contacted Annie Mullane on 19 February 1918, to report Leslie was still missing and could she give a statement. Ann was able to give them information that she had heard from the families of other soldiers from Hamilton and district. With Annie’s information and statements from witnesses at the front, Leslie’s Red Cross missing person file was closed. On Sunday 28 April 1918, William and Annie Mullane had a knock at their door. A knock they no doubt were dreading. The Very Rev. Monsignor Shanahan, the Catholic Parish Priest of Hamilton was on their doorstep with the news that Leslie was killed on 12 October 1917. By May, the newspapers had changed Leslie’s status to “Killed – previously reported missing”. Leslie is remembered in Hamilton on the Hamilton War Memorial and a tree was planted for him along Hamilton’s Anzac Avenue in June 1918.